BFGoodrich Long Trail T/A Tour tires provide SUV and Crossover owners increased highway performance to go along with a more comfortable ride and a longer tread life. Regardless of whether it is driving on dry, wet or even snow covered roads, the Long Trail Tour is built for spirited performance. The tire itself features a symmetrical tread design with an all-season compound to go with larger independent tread blocks. Add in a center rib and notched intermediate ribs and you have a tire that holds up well in the corners, as well as providing enhanced steering response. The result is increased confidence behind the wheel and a much more enjoyable driving experience. Driving on wet roads is made easier due to a better overall sipe design and multiple biting edges that improve grip in all weather conditions. On the inside of the BFG Long Trail T/A Tour are twin steel belts and Goodrich’s unique Equal TEnsion Containment System, or ETEC for short. The steel belts are spirally wrapped to give the tire added strength and stability at higher speeds, while also providing better long term durability. Overall, the Long Trail T/A performs well in all season conditions. You can expect a quiet and more comfortable ride to go along with a 60,000 mile tread life. This combines to make this tire an excellent value, as well as one that is enjoyable to drive on the highway. Prices on the BFG Long Trail T/A Tour range from around $101 for the 15 inch series to approximately $185 for the larger 20 inch series tires. Who Are BF Goodrich Long Trail T/A Tour Tires Designed For? BFGoodrich has developed the Long Trail Tour for drivers of all types of SUV’s and Crossover vehicles who want better road performance, without sacrificing ride comfort or a reduced tread life. BFGoodrich warrants the Long Trail T/A Tour for 6 years or 60,000 miles. 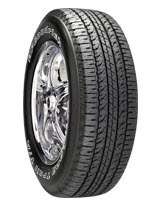 You will also find a 1 year or first 2/32 inch of wear guarantee on the tire’s uniformity. Materials and workmanship are backed for 6 years and include free tire replacement during the first year or first 25% of wear. BFG prorates out the amount for the remaining time period down to the last 2/32 inch of useable tread life on the tire.